The campaign more than doubled the brand's initial goals, securing 14 times more coverage than any other NBA team's patch announcement to date. Research software company Qualtrics silenced critics bemoaning NBA teams selling ad space on their jerseys by placing a logo for 5 For The Fight, which encourages cancer research donations, on Utah Jazz players’ jerseys. 5 For The Fight specifically invites individuals to contribute $5 towards cancer research and challenge five friends to do the same. The charity was created by Qualtrics founders Scott Smith and Ryan Smith in 2016. The logo will be worn by Utah Jazz players during the upcoming 2017-2018 season. NBA teams began debuting their patches in early 2017. Qualtrics, with the help of PR partner Method Communications, geared up to enter the fray through a partnership with the Utah Jazz. Instead of featuring its company logo on the jersey, as other sponsors had done, Qualtrics elected to showcase 5 For The Fight on the jersey to increase awareness and fundraising for cancer research. "Four NBA teams had previously announced their patches and secured only a handful of stories," explained Alex Koritz, partner at Method. "We knew entering the fray with a ‘me too’ story would be difficult, so we had to be creative about how to differentiate our angle." The team developed an aggressive media outreach strategy to generate local and national awareness of the new patch. The brand also looked to create a unique video to go along with the campaign. In addition to playing the video at Utah Jazz arena when the patch was announced, the campaign team wanted to spread the content online by sharing the video with reporters and encouraging followers to share it on social media channels. Method partnered with Nate Morley, group creative director at 72andSunny, to produce the campaign’s video. 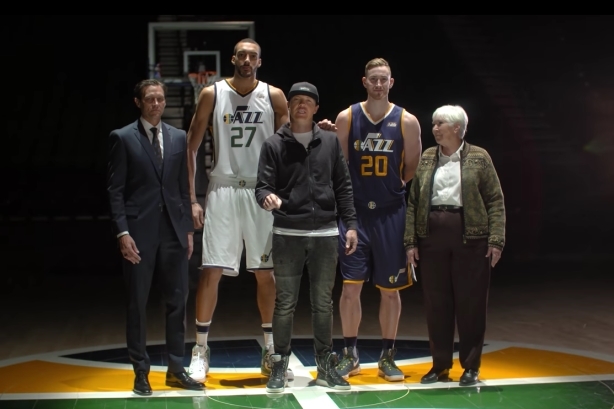 The video features influencers and celebrities showing support for 5 For The Fight, including: Nobel Prize-winning scientist Dr. Mario Capecchi, former NFL stars Steve Young and Jerry Rice, hip-hop artist Kascade, actor Michael Peña, and Utah Jazz star Gordon Hayward. Beginning in January, Method targeted local Utah publications with teaser information on the campaign to gain the attention of Utah Jazz fans. "We also targeted top-tier publications like Sports Illustrated, CNN, and USA Today because we felt the cancer-fighting cause was big enough to get the attention of large consumer press," said Koritz. The team referenced the new NBA patch as "first in its category" to pique media interest and provided interviews under embargo leading up to the announcement. On February 13, Ryan Smith, Jazz owner Gail Miller, and Jazz president Steve Starks unveiled the 5 For The Fight patch at a press conference held during the day at the Jazz arena, Vivint Smart Home Arena. Method ensured local press were in attendance and lifted the embargo for national media to publish stories. The press conference also served as the launch point for the campaign video. "During the Utah Jazz game that night, Ryan Smith appeared on the court to unveil the jersey patch and the 5 For The Fight video played on the Jumbotron," added Koritz. "Following the video, the entire crowd erupted with a standing ovation." The campaign team leveraged the hashtag #5ForTheFight, created in partnership with the Qualtrics digital team, and encouraged fans to engage with the brand on social platforms. The campaign more than doubled the brand's initial goals, securing 14 times more coverage than any other NBA team's patch announcement to date. More than 60 stories landed in Forbes, Business Insider, ESPN, Yahoo Sports, NBC Nightly News, and Associated Press. There were 266 total articles factoring in syndication and a total aggregate readership of more than 1.2 billion. Following the announcement, the #5ForTheFight hashtag trended on Twitter in Utah and generated more than 1,000 mentions with largely positive sentiment. Ryan Smith received hundreds of emails and Twitter DMs from NBA fans and people affected by cancer, who shared their excitement that a company used this jersey patch as a way to spread good rather than to receive more company exposure. The announcement video has been viewed over 18,000 times on YouTube. Editor's note, June 6, 2017: A previous version of this article incorrectly stated that $1 million was raised through this campaign to fund cancer research. That figure referred to a previous campaign by 5 For The Fight.